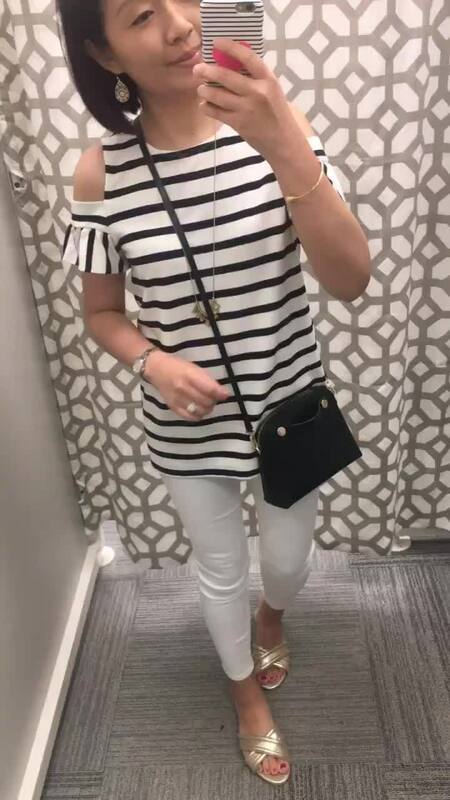 I received this cute striped cold shoulder flutter top in the mail last week and I love it! I wanted size XXS regular but the size sold out quickly online so I took a chance and ordered size XS regular which I had previously tried it on in purple here. I love the thicker straps which means that your bra straps won’t show. The arm holes are not generous so they don’t expose too much armpit unlike more flowy cold shoulder tops. 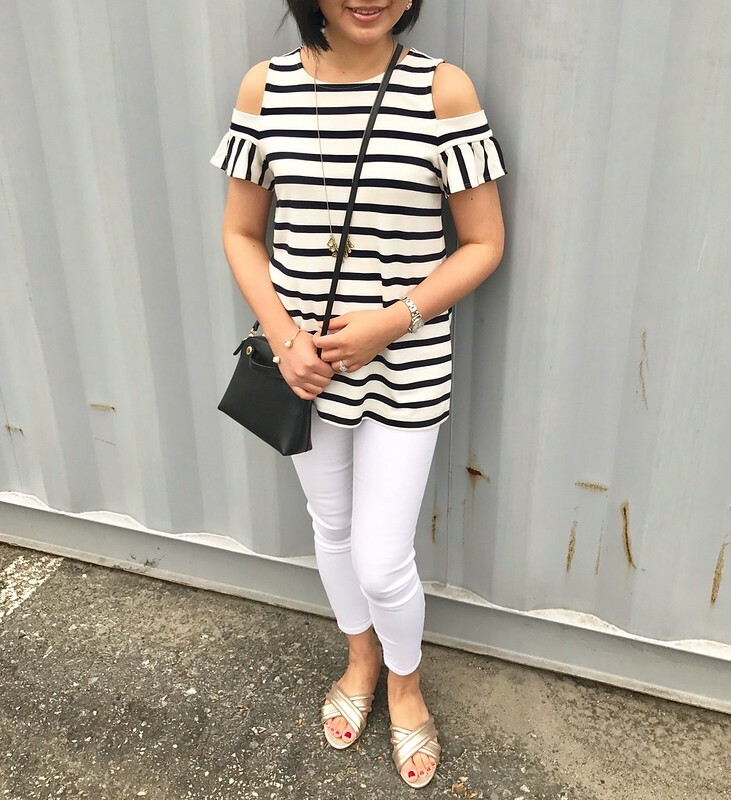 The material is a similar rayon/polyester blend that they used for my favorite ruffle cuff top (last seen here) which launders well. See size S regular on Dianna @budgetbabe. I ordered this tankini in size XL since online reviews said that it ran tiny however the cups were generous and it slipped right off of me. I debated between ordering size S or size M but I went with size S since I was afraid the cups would be too big in size M. See size S on me here. Click the following links for the measurements of size S: bust, waist, hip. For reference, I’m 5′ 2.5″ and I have a 27-28″ waist and 33-34″ hips depending on my weight. I tend to fluctuate between 108-112 pounds. I can easily put this on by pulling it on over my hips. However, I would be careful pulling this on/off as you may tug too hard at the ruching on the sides and hear a rip. I found that this tankini runs one size smaller if you have a straight figure like me. If you have a shapelier figure then it probably runs two sizes smaller to accommodate the hips. I have a small bust (32A in petite bras) so I love the lightly padded, molded cups and the twisted detail at the bust which creates an illusion of cleavage. I love this scalloped halter one piece swimsuit which I took in size 2 (runs true to size). Click the following links for the measurements of size S: bust, waist, length. The bust has pockets so that you can switch out the removable padding/lining if you need more help up top without worrying that the inserts will fall out. I also re-ordered size 0 in the scalloped one piece swimsuit (last seen here in size 4 with the straps taken up by my mom) to satisfy my curiosity since size 4 is slightly loose on me when the suit is wet. Since swimsuit shopping online is very difficult sizes do pop back in stock if you bookmark an item and check back. 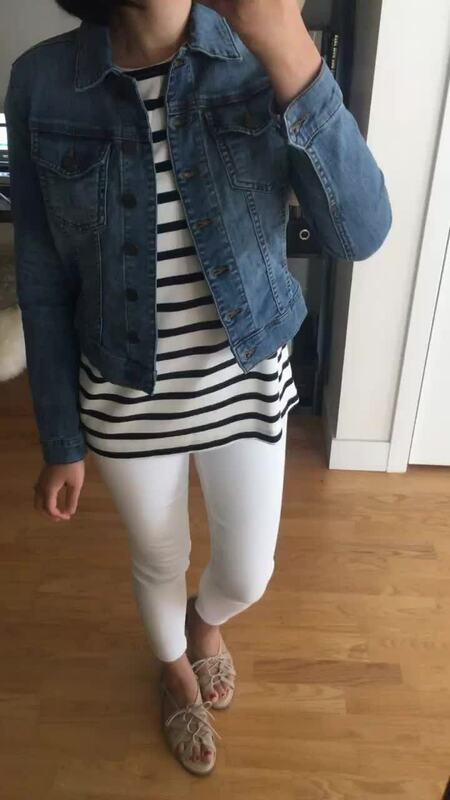 As mentioned in my previous post, I ordered two denim jackets by Kut From The Kloth and the empathetic wash is a similar style to the LOFT jean jacket that I already have (see it on me here). I tried on both colors in size XXSP and I found that the optic white color runs very narrow. The sleeves were very snug on me since my upper arms measure 10″. 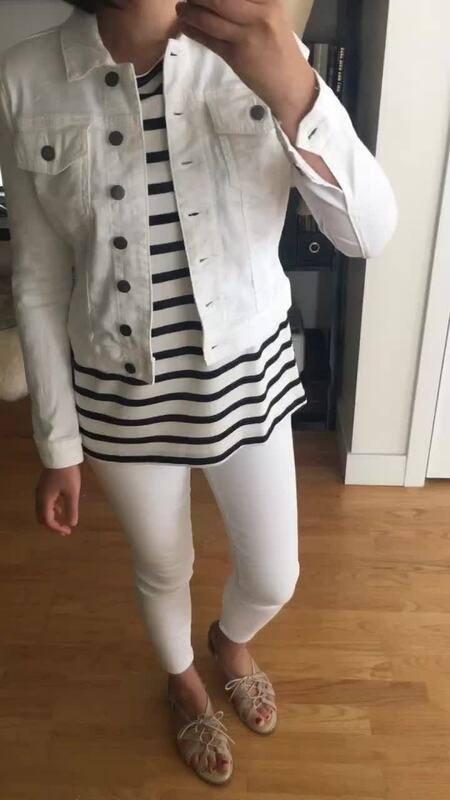 If you have a small bust and a slender petite build then I would recommend trying the optic white color if you typically have trouble finding denim jackets that fit. 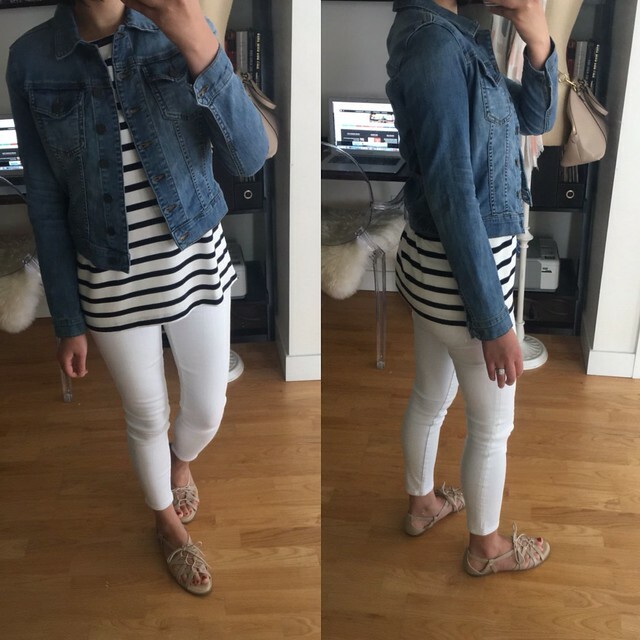 The empathetic wash fit me comfortably and the length is a bit more cropped than my other LOFT denim jackets. Note that I am usually size 0P/XSP at LOFT. I like the cropped length of these jackets and the light, stretchy fabric is 98% cotton and 2% spandex. The buttons are blank but the brand name is embroidered on the back, bottom hem of the jacket (refer to this picture). The logo in back is not noticeable in the white color because they used white thread.